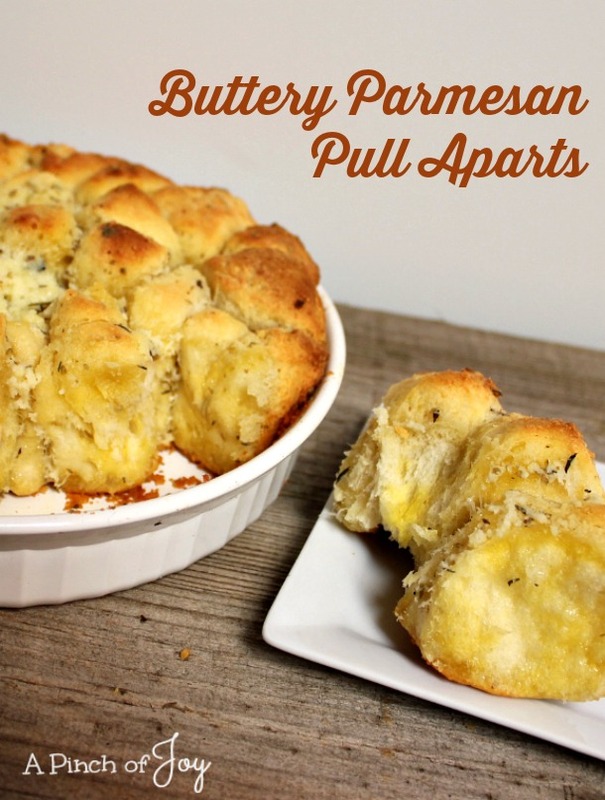 Buttery Parmesan Pull Aparts — one of those appetizers you want to keep eating! It’s just right flavor, the warm, buttery soft texture — mmmmm! Bake in a round cake pan or quiche pan. Resist the temptation to take it out of the oven when it becomes lightly golden. The center won’t be done. Let it bake until the outermost pieces become dark golden and the center resists a light finger push. Setting for five minutes before serving lets the center finish cooking. I serve right out of the quiche pan I bake it in, but you can turn it out onto a plate if you prefer. A classic appetizer, a delicious option for a salad go-with, or great with a quick supper! Melt butter in microwave, add garlic and stir well. Separate biscuits and cut each one into quarters and put into bowl. Pour melted butter over biscuits, add Itlaian seasoning and Parmesan cheese. Toss well until everything is coated. Bake for 25-30 minutes until golden brown. Do not underbake. Remove from oven and let rest for about 5 minutes. I’m so glad you stopped by today! Be sure to follow A Pinch of Joy so you don’t miss a thing! I’d love to have your company on this venture!! Subscribe: email on the sidebar or follow on Facebook / RSS feed / bloglovin’ / twitter and check out my pinterest boards. Share: if you found this helpful or inspiring please click one of the buttons below! Your support of A Pinch of Joy is appreciated! Hi Charlene, I do so enjoy your blog. I’m along fo the ride! I’ve nominated you for the Liebster Award. Follow the link and answer these 11 questions and most of all – have fun! 1. What made you decided to start a blog? 2. What is the most rewarding thing about blogging? 3. What is the most challenging thing about blogging? 4. What is your family’s favorite thing you make? 5. What is your favorite movie of all time? 6. Which holiday is your favorite? 7. What song do you find yourself humming when you are happiest? 8. What is your favorite dessert? 9. What is the first think that pops into your mind when someone ask you to bring a dish to a pot luck? 10. If you could travel anywhere, where would that be? 11.	Who would you take along on your trip?